Janet "Jennie" Douglas (Douglass) Hall; pioneer woman evangelist and pastor, was born 19 April 1863 near Brussels, Ontario to Robert Douglas (b. ca. 1836) and Jane McKersy Douglas (b. ca. 1839). She was the oldest child in a family of at least six children (two daughters and four sons). On 27 March 1889 she married James Hall (29 April 1860-15 July 1932), the son of William Hall and Margaret Hoath Hall. James and Janet Hall had two sons, William Robert (June 1890- ) and Lorance Douglas (27 November 1893-27 July 1924). Janet Hall died 18 November 1946. Janet Douglas grew up in a Presbyterian home in Huron County, Ontario. In 1877 or 1878 she moved with her family to Michigan, near Brown City. In February 1882 she was converted in evangelistic meetings held by David U. Lambert, an Evangelical United Mennonite (later Mennonite Brethren in Christ) minister. She began children's meetings in her home on Saturday afternoons during that summer. In the early months of 1884 she assisted S. B. Shaw, a holiness evangelist, in his meetings in Grand Rapids through visitation and personal witnessing. On one occasion she led a prayer meeting when Shaw's wife was unable to fill the appointment. Following this meeting she was asked to hold revival meetings in a nearby vacant church, which she did for five weeks. According to her own testimony, she scarcely know how to preach, so her services consisted primarily of testimonies followed by a 10-12 minute sermon. However over 100 persons professed conversion at these initial meetings. She then held evangelistic campaigns in other areas of Michigan, sometimes facing opposition because of her gender. On one occasion a woman advised her to "let the men preach, and go home and help your mother." One experienced evangelist who heard her preach in 1885 commended her content, but said she needed to speak more slowly. In March 1884, the Indiana-Ohio-Michigan conference of the Mennonite Brethren in Christ noted that Janet Douglas had received a permit from the Quarterly Conference in Michigan to "labor as an evangelist," and that in several months she had led 70 persons to Christ. It then duly recognized her as an evangelist within the conference. Consequently she was the first woman recognized by a North American Mennonite denomination as an evangelist and preacher. In fall 1884 Douglas began a city mission in Grand Rapids, Michigan, the first city mission of the Mennonite Brethren in Christ denomination. In October 1885 the first General Conference of the Mennonite Brethren in Christ noted God had chosen holy women to "prophesy and labor in the church," and thus resolved to allow "a sister thus chosen of God" to preach and labor for the salvation of souls under the supervision of a minister or presiding elder. In practical terms this meant she was not ordained, but was recognized as the equivalent to a probationary minister, and invited to participate in in the annual meetings of district conferences. In time (beginning in 1904) such women evangelists and mission workers became known as "ministering sisters." Janet Douglas's evangelistic work began a long period of leadership by women in the Mennonite Brethren in Christ denomination, particularly in city, and later overseas, missions. The leadership of women decreased in the mid-20th century as the Mennonite Brethren in Christ shifted theologically more towards fundamentalism and away from its holiness roots. In mid-1885 Janet Douglas went to Ontario and preached in all the major Mennonite Brethren in Christ communities as part of a traveling tent meeting or "tabernacle." She led evangelistic services in Elmwood and Dornoch, Ontario, pastored the church in Dornoch in 1886/87 and raised money for building a church in the community. She was formally accepted as a "laborer" in the Ontario Conference in April 1886 and twice made presentations at the conference's Ministerial Association. During 1886/87 she assisted H. S. Hallman at the Elmwood congregation, and led two series of evangelistic services at Kilsyth, south of Owen Sound, Ontario. In 1888 she was named a conference evangelist, but returned to Michigan in mid-year. In 1886 she compiled a hymnbook, Emmanuel Hymns for the Worship of God, for use in her evangelistic services. 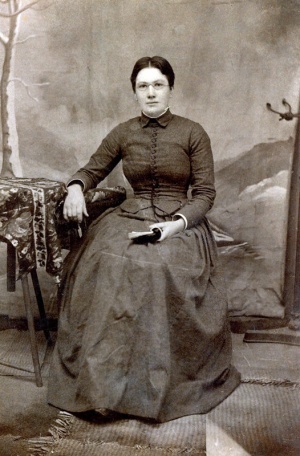 Shortly after her marriage to James Hall (who was converted at one of her meetings and was accepted as a probationary minister in the Ontario conference on 13 March 1889) they jointly served in rural mission work in Northern Michigan. In summer 1896 the family moved to California for health reasons, but returned to Michigan in 1903. In 1910 they homesteaded in Alberta, nine miles west of Alsask, Saskatchewan, where James served as a minister until they retired to Kitchener, Ontario in about 1929. Janet Douglas Hall preached at each location, but over time her public ministry decreased significantly. In Alberta she primarily led Sunday schools and helped provide leadership at camp meetings. James Hall took part in evangelistic services in Michigan only 10 weeks before his death. Janet Douglas Hall was a true pioneer in women's ministry, with many women within the Mennonite Brethren in Christ denomination soon following her example. She died in relative obscurity as the role of women leaders was increasingly reduced in the denomination, especially in the 1930s and 1940s. Janet Douglas Hall and James Hall are buried at First Mennonite Church in Kitchener, Ontario. Prominent Mennonite Brethren in Christ leaders who were converted and brought into the church by Janet Douglas included Ebenezer Anthony (1865-1913) and Maude E. Chatham (25 March 1870-23 November 1951). Detwiler, Noah. "The Tabernacle at Maryboro." Gospel Banner (15 July 1885): 8-9. Detwiler, Noah. "Tabernacle Meeting." Gospel Banner (1 September 1885): 8-9. Douglass, Janet. "Account of Meeting at Dornoch, Grey, Co., Ont." Gospel Banner (15 February 1886): 9. Douglass, Janet. "From Elmwood, Ont." Gospel Banner (15 December 1885): 12. Douglass, Jennie. "The Grand Rapids Mission." Gospel Banner (1 January 1885): 4-5. Garnaat, Jason C. "Women in Ministry in the Mennonite Brethren in Christ." Unpublished paper, 1995. Missionary Church Archives, Mishawaka, Indiana. MCII-HI-1-12. "Hall, Mrs. James." Gospel Banner (5 December 1946): 7. Hershey, Eusebius. "My Object." Gospel Banner (1 July 1885): 12. Lambert, D. U. "From our Fields of Labor." Gospel Banner (1 October 1884): 1. "Mrs. Janet Hall." Kitchener Record (18 November 1946): 15. "Rev. James Hall." Gospel Banner (4 August 1932): 13. "Rev. James Hall." Kitchener Daily Record (15 July 1932): 17. Storms, Everek R. History of the United Missionary Church. Elkhart, Ind: Bethel Pub. Co, 1958: 250-252. Steiner, Sam. "Hall, Janet Douglas (1863-1946)." Global Anabaptist Mennonite Encyclopedia Online. June 2010. Web. 23 Apr 2019. http://gameo.org/index.php?title=Hall,_Janet_Douglas_(1863-1946)&oldid=134708. Steiner, Sam. (June 2010). Hall, Janet Douglas (1863-1946). Global Anabaptist Mennonite Encyclopedia Online. Retrieved 23 April 2019, from http://gameo.org/index.php?title=Hall,_Janet_Douglas_(1863-1946)&oldid=134708. This page was last modified on 23 June 2016, at 13:37.